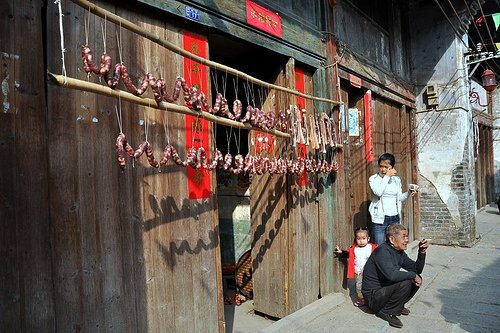 La rou and la chang (Chinese winter sausages and bacon) being dried in the winter sun, somewhere in Guilin, China. One week before Chinese New Year and there's so much busyness you can feel it all around. I don't even bother to go to the city because of the traffic. I hate having to queue on the road, queue at the check-out counters, queue to get out of parking lots. Another thing I absolutely hate this time of the year is the crazy, noisy CNY music. Absolutely hate it, nearly as much as I hate the wooden clucking of Dutch folk music. I was just at Thai Seng Supermarket last week and people were buying canned food, cooking oil, Chinese winter sausages and all those CNY stuff and I was thinking "Am I the only one who hasn't started doing anything about CNY?" So I grabbed some cassava flour, some sugar, some veggies from Hong Kong (they have sweet pea sprouts for the first time, so there's no need to them get from Hong Kong) and I got home and made prawn crackers. We haven't had the sun for weeks and the last two days when I needed it, the sun came out. Somebody does like me. The prawn crackers turned out perfect, smooth, full of flavor and they puffed about four times their size. Again, I urge you to make your own prawn crackers because there's no way commercial prawn crackers are made with prawns. 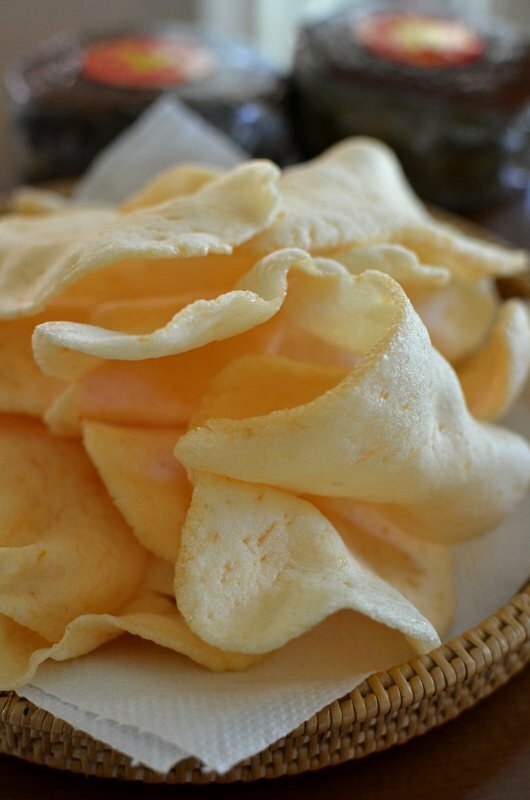 Addictive home-made prawn crackers. This year, I made my prawn crackers with yellow prawns and sand prawns. The cheaper paper-skinned white prawns are all farmed. In fact, all prawns served in restaurants are farmed and the redder they are, the more likely they are to have been fed a diet that includes dye. The fried prawn crackers expanded more than four times the original size. 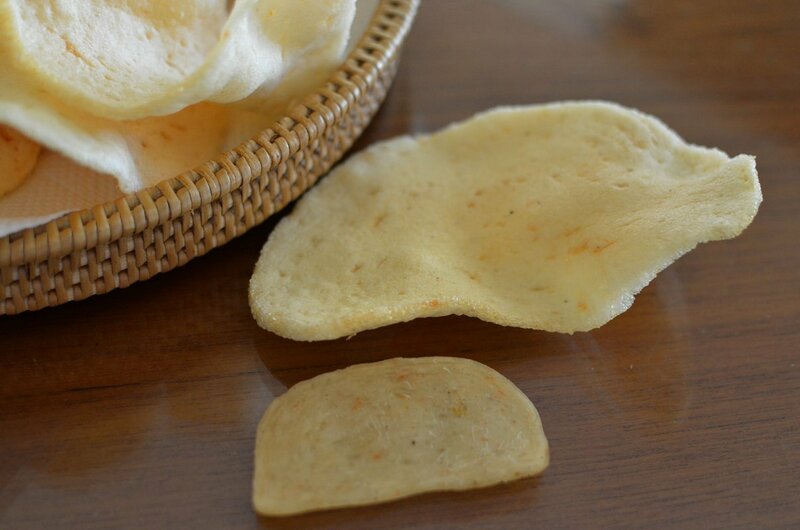 Specks of minced prawns are visible, unlike commercial prawn crackers which are clear and translucent before frying. I made chi ku chips too. 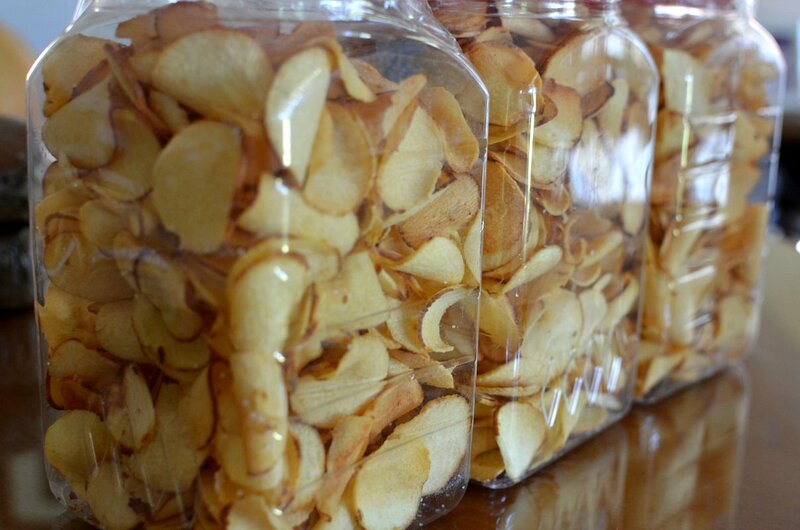 This year, I didn't peel the chi gu to keep the fiber and also to reduce wastage. I over-fried them but no matter, they are still delicious. With the huge CNY meals looming ahead, I've cut back on my intake of carbs so that I won't spill out of my new dress. CNY is that time of the year when we are likely to meet friends we haven't seen since the previous CNY so there's tremendous pressure to look better or at least unaged. 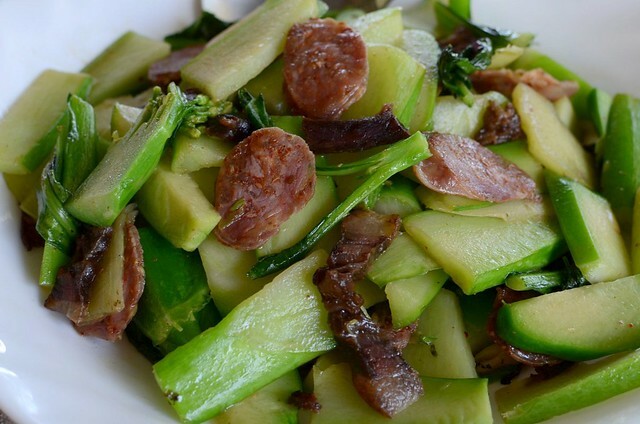 With all the busyness, or the busyness in being busy, I'm taking it easy and a meal can be just fried veggies with winter sausages or la rou (Chinese bacon). On our visits to China in the wintry months, la rou and la chang are always on the menu. In the villages and smaller towns, every family makes their own la rou and la chang. I am so blessed every year because my friends from China would get their moms to make extra la rou and la chang for me, and since one friend is from Sichuan and the other from Jiangxi, I get different varieties of la rou and la chang. Home-made la rou la chang are SO different, SO SO much more delicious and fresher than those in the stores. If you are wondering what to cook during this busy period, just slice some Chinese sausages or la rou or both (I used home-made Sichuan sausages and store-bought Cantonese la rou) and toss with with a bit of veg oil in a smoking hot wok or frying pan, add parboiled veg, sprinkle some salt and rice wine over and that's a light dish that goes well with rice. 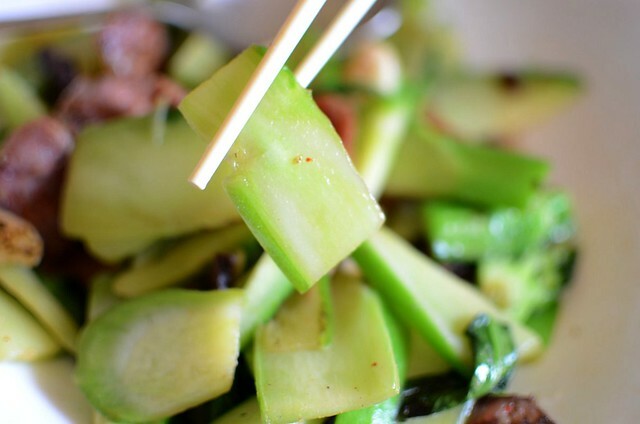 Kailan stems are all stems and no leaves, available this time of the year. Very crunchy and sweet. And now excuse me while I run off to make pineapple tarts and almond crisps. michelle: i find it crazy tt we pay so much at seafood restaurants to eat farmed fish and prawns that are fed on antibiotics and growth hormones. am afraid tt those old days of home-grown food and seafood from the sea are gone...it's cheaper n more convenient to 'grow' seafood under controlled environment. we must be well-informed n careful about the sources of our food. i think most ppl don't question and just go along with the crowd and the crowd is jsut as ignorant and indifferent. my mom would be so happy that u and my sis-in-law continue to make her famous prawn crackers. yours look as good as my mom's. my sis-in-law is going to make some for me when my eldest sis comes over in sept.love to try yours the next time i go back for cny. Happy new year! Anyway, have a good holiday with your family. Am sure Hong Yi is back and it will be a blast! wendy: yes, this year's prawn crackers are the best so far bc they're very 'loose' textured:) u know what, the dough was still sticky after mixing n i didn't want to run out to find tapioca flour so i used potato starch n quite a bit too. so daring ah! and it still works! thanks to your mom for teaching me (i still rmber standing there watching her knead:) and how she pinched off a bit of the dough to taste it). i can make more and pass to your sil to bring to you. heck, i'll bring them myself but i'd like to visit in the spring (more snow on mountains in banff)so have to be next year. anyway, gong xi fa cai to all of you! runningbrook: wah, what a maid, telling you tt you'll be on your own lol! but really, making prawn crakers is easier than say making cookies or cake! just throw the flour and prawn mince into the mixer, take out, knead a few minutes, shape, steam, cut, dry and fry! gong xi fa cai to you and fam! I have been wondering why I'm so busy being busy for the sake of CNY. There's so much to do! New Diet Taps into Pioneering Concept to Help Dieters Get Rid Of 20 Pounds in Just 21 Days!